Heavy snow is expected to break out ahead of a developing area of low pressure and area of warm air advection. 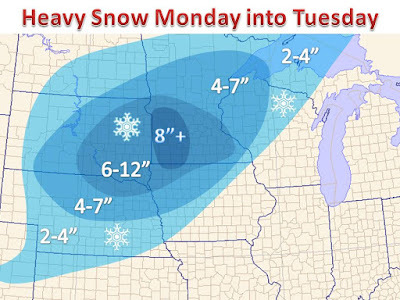 The snow will begin Monday morning for most places. 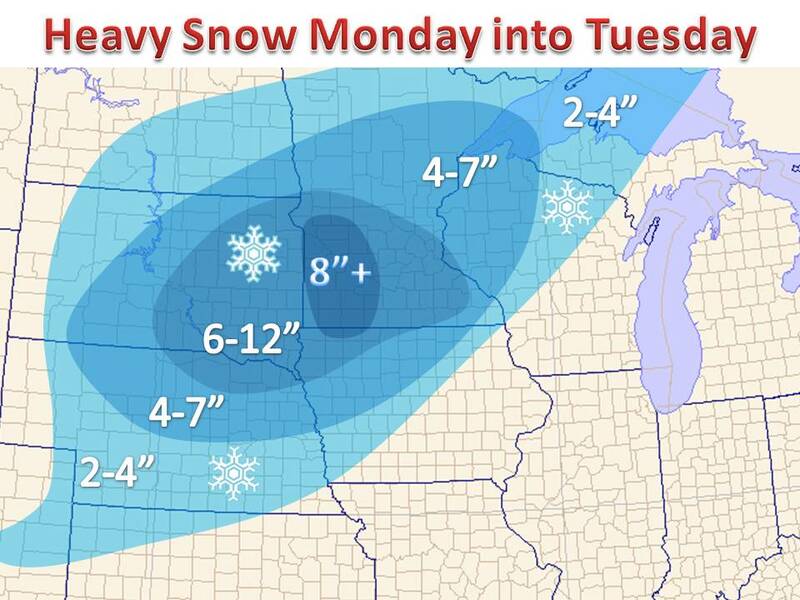 I wide swath of 6-10" from Sioux City to Minneapolis is expected. Areas near the Mississippi River will battle warm air surging north from the Gulf of Mexico on Monday, hense the heavier snow west. Higher terrain will amplify snow total in southwest Minnesota, where over a foot of snow is possible. Many of the short term models do indicate numerous areas on banding, so a large gradient in final snow totals is expected. One city could maybe have 8" but 30 miles to the east or west might end up with 3". It will depend exactly where each band sets up. Unfortunately it can be tough to forecast such events, but the most likely amounts are plotted above. Thanks for stopping by at Midwest Weather. Check out the tabs above for more weather information, especially the computer snow output page!